As a provider of gas and electricity to millions of Californians, PG&E has a long history of taking action to combat climate change—from an operational, investment and policy perspective. Today, we remain focused on managing our carbon footprint, advancing low-carbon policies for California and the nation, helping our customers reduce their energy use with industry-leading tools and incentives, and addressing the need to adapt to changing climate conditions. PG&E fully supported SB 350 as an important step toward achieving California’s aggressive climate change and clean energy goals. It builds on a strong legacy of policy leadership in California that, in turn, has helped the state maintain leadership in technology, the environment and innovation for decades. To do our part, we are taking an integrated approach to achieve sustainable greenhouse gas emission reductions in a way that manages costs for our customers, delivers safe and reliable electric and gas service, and creates a model program for others to follow. PG&E’s long-standing commitment to address climate change and prepare for California’s carbon market was featured in a report by the World Bank’s Partnership for Market Readiness. We believe it is critical that investors, customers, policymakers and other stakeholders have access to information that allows them to assess and understand a company’s risks and opportunities associated with climate change. PG&E reports its greenhouse gas emissions to the California Air Resources Board (ARB) and U.S. Environmental Protection Agency (EPA) on a mandatory basis. On a voluntary basis, PG&E reports a more comprehensive emissions inventory to The Climate Registry, a nonprofit organization. Each year, PG&E also reports its greenhouse gas emissions and climate change strategies to the CDP, an international not-for-profit organization that requests information on behalf of institutional investors. An integral part of our business is working with customers to help them achieve energy savings and greenhouse gas emission reductions through some of the nation’s leading programs and incentives for energy efficiency, demand response and solar installation. These efforts include helping local governments develop strategies and implementation plans to reduce emissions, including providing them with community energy profiles to assess opportunities and connecting them with PG&E programs and other resources that meet local needs. PG&E understands the need to reduce utility sector emissions. While some companies have adopted voluntary greenhouse gas reduction goals, PG&E is committed to helping the state meet the long-term targets established by the Governor and, in the near term, California’s Global Warming Solutions Act, or AB 32. This law requires California to gradually reduce its greenhouse gas emissions to the 1990 level of 431 million metric tons of carbon dioxide (CO2)-equivalent by 2020. The law covers emissions from PG&E’s fossil-fuel power plants, natural gas compressor stations and electricity imported into California. In 2015, it expanded to cover emissions from the combustion of natural gas delivered to customers. We are actively working to reduce our carbon footprint in a variety of ways, such as increasing supplies of clean and renewable energy, reducing energy use in our facilities, avoiding emissions in our operations, investing in lower-emission vehicles and building a more sustainable supply chain. PG&E is committed to promoting a diverse set of low- and zero-carbon resources to drive clean energy innovation in California and beyond. This approach can reduce greenhouse gas emissions in an economically sustainable and environmentally effective way, while spurring innovation and job creation. PG&E actively engages in ARB’s stakeholder activities to refine California’s cap-and-trade program implementation in order to meet AB 32’s greenhouse gas emissions reduction goals at the lowest possible cost to customers. 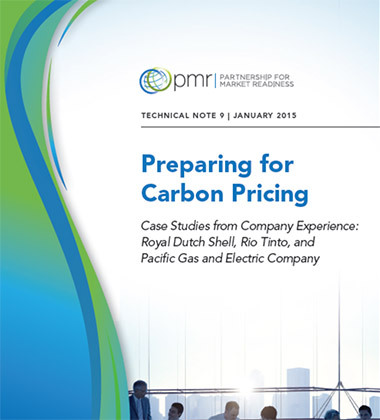 Features that will help mitigate costs to customers include free allocation of greenhouse gas emissions allowances to utilities for the benefit of their customers, a sufficient supply of high-quality offsets, robust market oversight and an allowance price containment reserve that reduces the risk of excessively high allowance prices. In 2014, the U.S. EPA proposed new CO2 regulations, known as the Clean Power Plan, for new and existing power plants under section 111 of the Clean Air Act. We are working closely with the State of California and U.S. EPA to ensure that the final rules align with California’s climate change policy and the progress made to date toward reducing greenhouse gas emissions from California’s electricity sector. In August 2015, U.S. EPA released the final Clean Power Plan which includes guidelines for each state to develop plans to achieve greenhouse gas reduction targets under section 111(d) of the Clean Air Act. PG&E appreciates the significant outreach and stakeholder engagement conducted by the U.S. EPA in conjunction with the rule’s development. It is expected that this first-ever national program to reduce greenhouse gas emissions from the power sector will advance investments in clean energy technologies throughout the country and provide tremendous environmental benefit. Ultimately, PG&E wants to ensure that the U.S. EPA’s rules provide the flexibility to recognize the unique circumstances and emissions profiles of power companies and individual states across the country. We will also work with stakeholders to explore opportunities to develop regional compliance approaches, including regional cap-and-trade programs. Central to our approach is engaging at the state, federal and international levels through a variety of policy think tanks and advocacy groups, such as the Center for a New Energy Economy, Georgetown Climate Center, Center for Climate and Energy Solutions, Alliance to Save Energy, Edison Electric Institute, Bipartisan Policy Center, Electric Power Research Institute, International Emissions Trading Association, Business Council for Sustainable Energy, Coalition for Emission Reduction Policy, Natural Gas Downstream Initiative and the Electric Drive Transportation Association. PG&E is collaborating with other leading electric utilities in the U.S. Department of Energy’s Partnership for Energy Sector Climate Resilience to share best practices on reducing vulnerabilities to climate impacts. Since 2008, PG&E has been investigating the potential physical risks of climate change to our system. We have identified a number of potential risks to our business, including sea level rise, temperature changes, rainfall and runoff patterns, wildfire risk and storm frequency and intensity. Robust emergency response plans and procedures to address near-term risks, including more extreme storms, heat and wildfires. Active engagement at the federal, state, and local level on climate change adaptation and resilience. A multi-year, comprehensive risk assessment process to prioritize infrastructure investments for longer term risks, such as sea level rise. An in-house climate change science team that regularly reviews the most relevant science and integrates its research into PG&E’s risk assessment process. PG&E participated in a climate change adaptation workshop co-hosted by the California Public Utilities Commission and the California Energy Commission. The event explored the physical vulnerabilities of California’s gas and electric systems due to climate change and the actions that utilities like PG&E are taking to adapt to those changes. 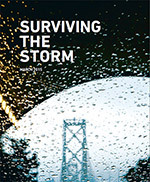 The Bay Area Council Economic Institute published “Surviving the Storm,” a report that found that a Superstorm and the associated flooding could have a $10.4 billion impact on the San Francisco Bay Area economy. The report included solutions for creating greater regional resilience with a focus on the need for increased investment in flood control. Included in the report is PG&E’s estimate that disruption to several Bay Area substations could result in an economic impact of up to $125 million—an impact mitigated by PG&E’s redundant electric system where substations are interconnected through the electric grid and typically can play a back-up role to one another to help minimize customer service interruptions. PG&E continues to make substantial investments to build a more modern and resilient gas and electric system that can better withstand extreme weather and natural disasters. As California experiences one of the most severe droughts on record, we are working diligently to steward our water resources in a responsible manner and ease the drought’s impact on customers, communities and our own operations. With regard to increased electricity demand from more extreme, persistent and frequent hot weather, PG&E believes its strategies to reduce greenhouse gas emissions—such as energy efficiency and demand response programs, infrastructure improvements and the support of renewable energy development and storage—will help offset the expected rise in demand. We also continue to engage with multistakeholder groups on climate adaptation, including the Bay Area Council, U.S. Department of Energy’s Partnership for Energy Sector Climate Resilience and a variety of other forums at the local level in our service area. Increased renewable energy. We remained on track to meet the state’s requirement to deliver 33 percent renewable energy by the end of 2020. By the end of 2014, we reached 27 percent. An additional 8 percent came from large hydroelectric power, which does not count toward the state’s 33 percent goal. Reduced facility energy use. We reduced energy use by more than 8 percent, meeting our annual target and five-year reduction goal. Reduced methane emissions. We avoided the release of nearly 35,000 metric tons of CO2-equivalent emissions. These savings were achieved primarily by replacing older gas mains and by implementing a technique called cross-compression, where natural gas is transferred from one pipeline to another during pipeline construction and repair projects. Continued to green our fleet. We added new plug-in electric vehicles to our fleet and joined the Edison Electric Institute in calling on utilities to invest 5 percent of their total fleet investment, or approximately $1 billion, in plug-in electric vehicle technologies starting in 2015. Under AB 32’s annual reporting requirements, PG&E reports greenhouse gas emissions to the ARB. These reports include emissions from our electric generation facilities, natural gas compressor stations, natural gas supplied to customers and the fugitive emissions from our natural gas distribution system and compressor stations. In 2015, as part of California’s cap-and-trade system, PG&E anticipates a compliance obligation associated with the emissions from the combustion of natural gas supplied to customers, excluding the fuel that is delivered to covered entities. The following table shows the greenhouse gas emissions data PG&E reported to ARB under AB 32. 1 PG&E’s utility-owned generation comprised more than 35 percent of our delivered electricity in 2014. PG&E also reported N2O and CH4 emissions from each of our generating stations. 2 Includes compressor stations emitting more than 25,000 metric tons of CO2-e annually. 3 The increase in emissions was largely due to the inclusion of more sources in the mandatory reporting requirements, including customer meters and pipeline dig-ins. PG&E previously reported emissions from these sources only under its voluntary greenhouse gas emissions inventory. 4 Includes emissions from the combustion of natural gas delivered to all entities on PG&E’s distribution system, with the exception of gas delivered to other natural gas local distribution companies. This figure does not represent PG&E’s compliance obligation under AB 32, which will be equivalent to the above reported value less the fuel that is delivered to covered entities as calculated by ARB. PG&E also reports the greenhouse gas emissions from our facilities and operations to the U.S. EPA under its mandatory reporting requirements. PG&E’s voluntary greenhouse gas emissions reporting showed that PG&E’s CO2 emissions rate was approximately one-third of the national utility average in 2013, the most recent year for which verified data are available. PG&E’s emissions rate of 427 pounds of CO2 per megawatt-hour of delivered electricity takes into account both PG&E-owned power generation and power purchased from third parties. From year to year, several factors affect PG&E’s power mix and emissions, including demand growth and the availability of clean hydro power. However, PG&E’s emissions have continued a downward trend. Our 2013 emissions rate is 17 percent lower than the past five-year average of 500 pounds of CO2 per megawatt-hour. PG&E’s total CO2 emissions from delivered electricity decreased to 15.8 million metric tons in 2013. This was largely due to lower demand for electricity and an increase in renewable energy. Reduced demand and cleaner energy led to a drop in PG&E’s Scope 1 and Scope 2 greenhouse gas emissions. These emissions, from sources PG&E has direct control over—including owned power generation, fleet and our own electricity use—were just under 5 million metric tons CO2-equivalent in 2013. Higher customer demand for natural gas was the primary driver for an increase in our Scope 3 emissions. 1 Source: U.S. Environmental Protection Agency eGRID Version 1.0, which contains year 2010 information configured to reflect the electric power industry’s current structure as of February 24, 2014. 2 Because PG&E purchases a portion of its electricity from the wholesale market, we are not able to track some of our delivered electricity back to a specific generator. Therefore, there is some unavoidable uncertainty in PG&E’s total emissions and emissions rate for delivered electricity. 1 Because PG&E purchases a portion of its electricity from the wholesale market, we are not able to track some of our delivered electricity back to a specific generator. Therefore, there is some unavoidable uncertainty in PG&E’s total emissions and emissions rate for delivered electricity. 2 The emissions associated with purchased electricity are considered Scope 3 per The Climate Registry’s Electric Power Sector Protocol for the Voluntary Reporting Program, Annex I to the General Reporting Protocol, June 2009, Version 1.0. 3 This figure includes the emissions from the combustion of natural gas delivered to all entities on PG&E’s distribution system, with the exception of gas delivered to other natural gas local distribution companies, as well as gas delivered to PG&E facilities such as power plants, compressor stations and offices, the emissions of which are reported separately. 1 This figure includes the emissions from the combustion of natural gas delivered to all entities on PG&E’s distribution system, with the exception of gas delivered to other natural gas local distribution companies, as well as gas delivered to PG&E facilities such as power plants, compressor stations and offices, the emissions of which are reported separately. 2 Other Scope 3 emissions include the greenhouse gas emissions from business air travel, waste management and employee commuting. PG&E began measuring these optional categories for its 2012 emissions. 1 Data represent totals through 2014. PG&E provides data, financial assistance and technical support to local governments for the development of greenhouse gas inventories and climate action plans tailored to the unique needs of individual communities. The inventories include analyses of energy consumption, vehicle fuel use and waste production to provide a baseline for measuring future greenhouse gas reductions. Climate Action Plans outline a set of policies, programs and ordinances necessary to meet greenhouse gas reduction goals at the local level. PG&E has made significant contributions to the state’s progress toward a low-carbon future and is well on its way to meeting California’s ambitious clean energy goals through renewables, energy efficiency, support for distributed resources, infrastructure investment and efforts to get more electric vehicles on the road. We will continue to do our part to further reduce greenhouse gas emission levels in the electric and gas sectors. 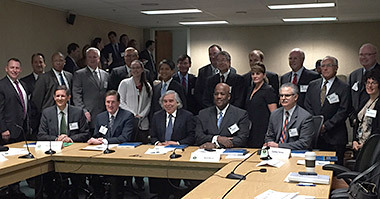 This includes our active engagement on state and local policy, such as the governor’s ambitious greenhouse gas reduction target, as well as discussions around new Clean Air Act greenhouse gas regulations with the U.S. EPA, the State of California, and stakeholders as the framework and details for the rules are finalized. We also remain focused on providing some of the nation’s cleanest energy to our customers. One important milestone was the development of a new community solar program that will give customers the option to purchase 50 or 100 percent solar power locally produced in their area for a small incremental cost. The program is in development, with a launch date pending CPUC approval. 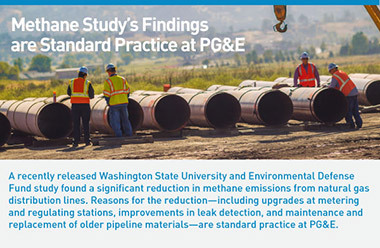 PG&E contributed to the findings of a comprehensive, peer-reviewed study published in Environmental Science & Technology that confirms methane emissions from local natural gas systems have significantly decreased in the past 20 years, even as the systems’ mileage has increased. Improvements made to the natural gas system are contributing to a reduction in greenhouse gas emissions nationwide.